BBC Scotland has learned that Charles Green's Sevco 5088 company is not currently permitted to inherit the name 'The Rangers Football Club'. Any attempt to adopt the name 'The Rangers Football Club' would require the approval of the liquidators, BDO. 'The Rangers Football Club P.L.C. ', which has the registered company number SC004276, has not yet been dissolved, but will inevitably be liquidated due to unpaid debts. BBC Scotland can confirm that the company's liquidators, BDO, have not yet taken control of the company's affairs, and may not do so for some time. Green's consortium confirmed to BBC Scotland that a purchase of the assets and intellectual property of The Rangers Football Club P.L.C. has been concluded with the administrators Duff & Phelps, which includes the company name. A Rangers spokesman told BBC Scotland: "The administrators have already given their approval for the name change and the process will be completed shortly. "The company name was part of the assets of the company which was sold to Charles Green's consortium." The spokesman also said any regulatory problems related to changing Sevco 5088's name to The Rangers Football Club Ltd are not currently an issue because liquidation of the old company has not yet commenced. 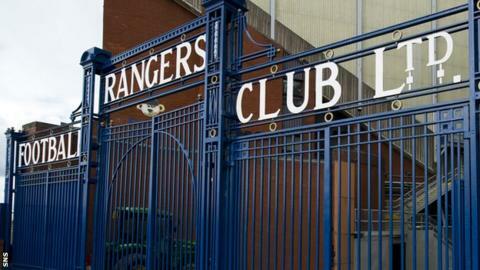 However, a Companies House spokesperson told BBC Scotland: "Sevco 5088 would not be able to apply to change its name to 'The Rangers Football Club Ltd' until either the original company is fully dissolved, a process which can take about a year to complete, or the receivers give the go-ahead for the name change to take place. "From a regulations standpoint, once the receivers or the liquidators/administrators for the current PLC agree to a name change, Sevco 5088 could then apply to change its name to 'The Rangers Football Club Ltd'. "If they apply without following this procedure, systems are in place to flag up names which are too similar." Article 10.7 of the Scottish FA's Articles of Association states that the name of a club cannot be changed without SFA board approval, while Article 74.2 states that a club's name cannot be changed to anything linked with sponsorship. Green's newco continues to trade under the name Sevco 5088, which has the company number 08011390, meaning it was registered in England. The sole director listed on the Companies House website is Charles Alexander Green, and while the company may trade under any name it chooses, its legal name cannot be the same or similar to another company in the register. The 'Sevco' prefix is a generic company name, often used by organisations which register companies on someone else's behalf. Sevco names can be registered in bulk through Companies House and renamed at a later date as long as strict naming criteria are met. The proposed name for the new Rangers company is 'The Rangers Football Club Ltd'. All UK companies limited by liability via shares or guarantee must end with 'Limited' or 'Ltd.' - only public companies traded on the stock exchange can end in PLC or P.L.C.